Mina Rajabi Paak talked with panelists about the conditions for precarious workers. Acid burns that blacken skin, sixteen-hour workdays with no overtime pay, racial slurs, even physical assault: those are some of the horrific experiences precarious workers in Ontario endure. The “Decent Work Now and in the Future” panel described these all-too-common experiences on Monday afternoon at the OFL Convention. 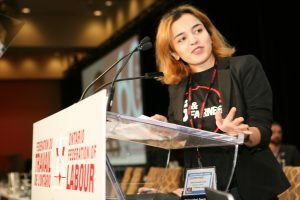 As panelists described their experiences with unscrupulous employers, OFL delegates could be heard repeatedly calling out “Shame!.” The young organizers and Toronto Star journalist Sara Mojtehedzadeh described the realities faced by so many Ontario workers. Journalist Sara Mojtehedzadeh describes the conditions she witnessed while reporting undercover at Fiera Foods. ” she said. “Workers are paying the price for that,” she added. 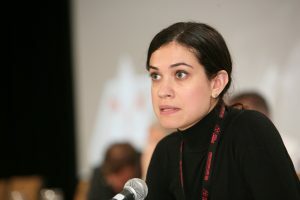 Mojtehedzadeh told the audience that the mainly newcomer and racialized workers she toiled alongside for a month, are often ill-equipped to push for their rights. Suleman Basharat, an organizer with UNITE HERE 75, speaks about what has worked to organize precarious workers. Panelist Suleman Basharat told the convention the to do that takes a lot of coordination. 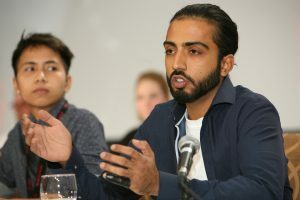 As a server at the Rogers Centre and a leader in UNITE HERE 75, Basharat explained that there are three key ingredients necessary to successfully organize precarious workers: leadership development, committee building, and innovation. “Things have evolved, so must we,” said Basharat. 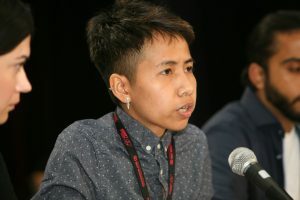 By uniting a workforce primarily comprising first and second-generation Canadians they were able to successfully negotiate contracts for food workers at multiple locations as part of the UNITE HERE campaign, Basharat explained. Their organizing was so successful, the workers even managed to ensure that an abusive chef who had assaulted a black woman was eventually let go. Kara Manso talks about the difficulties faced by live-in caregivers. Kara Manso, a caregiver and organizer with the Caregivers Action Centre said she believes it is racist to require migrant workers to work for several years for one employer before being granted permanent status. Moderator Mina Rajabi Paak, president at York University Graduates Students Association, acknowledged the many gains that are being made. She spoke about the anticipated passage of Bill 148, which will increase the minimum wage to $15 by 2019 and guarantees sick days and equal pay for all temporary and contract workers. Then she pointed out that the labour movement clearly has much more work to do to push the government to go further. “The stakes are really high for workers in this province. I hope that you will go back to your unions and go back to your communities and continue that fight,” concluded Paak, smiling as the delegates who rose in a standing ovation, whistling and cheering in support. To download the app, which features the convention agenda, documents, and social media as well as speaker bios and an opportunity to share your convention photos, go to the iTunes App Store, or the Google Play store and search: OFL Mobile App. To download the app for Android click here. Follow us on social media @OFLabour or on Facebook.